Clean your mower If the outside of the mower is dirty, heat can build up and wear out the parts too quickly. So you need to get rid of any built-up grass and dirt on the underside of the deck around the blade. To clean the underside, you need to turn the mower over, so you'll have to drain the fuel tank first. Disconnect the rubber hose from the tank to the engine and drain the gasoline into a bucket. Remove the spark plug or find a way to ground the plug wire. With a putty knife, scrape away any grass, being careful not to nick the undercarriage. Then you can wash it with a hose. Sharpen the blade A dull blade tears rather than trims grass, so sharpen your blade. Loosen the bolt with a wrench; if it doesn't budge right away, spray WD-40 lubricating oil on it. Use a file or a bench grinder and follow the blade angle evenly along its length. Replace the spark plug Replacing the spark plug is a good idea. Remove the wire and use a socket wrench designed to extricate plugs. Don't overtighten the new plug; reposition the wire. Change the oil and filter Then change the oil and the filter, and clean the fuel tank. Take off the engine cover (screw removal usually), and vacuum out dust and dirt first. Remove the oil dipstick, tip the mower, and drain the oil. With the hose disconnected, lift the fuel tank; clean it by putting a little gas in and swooshing it around a bit, then disposing of the gas. The old air filter should easily slide off the carburetor fitting for replacement. Clean your mower These motors also can burn out if they get too hot, so make sure air vents are free of grass and dirt. The best way is by removing the motor housing and blowing the stuff out with a shop vacuum. Check the plug on the power cord. If the prongs are bent, straighten them with pliers. If a prong is loose or broken, you'll need to take the machine in for a new plug. Check the extension cord for cuts or abrasions. The cord connecting the switchbox on the handle to the motor can get pinched and tear. Tears in the casing can be wrapped with electrical tape; replace the cord if the wires inside have been cut. Check brushes and replace if necessary Most electrical motors have two carbon blocks called brushes that wear down and need replacement. On most models, the brushes slide in and out for replacement. They should be changed if the brushes are longer than they are wide. Check the blade For blade replacement or sharpening, follow the procedure listed for gas-powered models. Clean underneath the deck with a hose; allow some time for the deck to dry, though electric mowers, unlike toasters, are designed to operate in the rain. Adjust your wheels Make sure the wheels are adjusted at the same height, or you'll get an irregular cut. Check the blades and bearings Grass is cut by a spiral reel of blades as you push, but only grass that comes between the cutter bar and the reel. To make sure the cut is even across the cutter bar, insert a sheet of paper and turn the blades. If only part of the paper gets cut, adjust the bar (check the owner's manual), but don't overtighten. Regularly lubricate the mower's bearings and cutting edges. Reel blades tend to get dull quickly; if a local hardware store won't sharpen them, you can do it yourself. If the blades are not that bad, lapping compound should do the trick; a kit is probably available from the mower manufacturer. You remove one of the wheels and fit a hand crank on the axle. With a paint brush, apply the lapping compound evenly on the blades and the sharp edge of the cutting bar, cranking until the blades become sharper. If the blades are really dull, use an abrasive strip also available from the manufacturer. If you have a gas-powered reel mower then follow the tips for gas-powered mowers. If the John Deere aluminium push mowers were a little out of your price range, then you might find Toro's offerings a little easier to swallow. Toro's SR4 Super recycler range consists of 6 models from the 20053 up to the big 20058 are well-priced aluminium decked mowers. If you were not after aluminium then the steel Recycler range would be a great place to start. These products from Toro have all had great reviews and the range has been around for a couple of years, these models superseding their older brothers. The features that the 20055 have is incredible for its price and I think it stands out as a great lawn mower. Things like rear-wheel self-propulsion and the aluminium deck are what you would expect to get on mowers that are probably 50% more expensive than these and Toro has done a great job keeping the price down. The 20055, like the whole Super Recycler range, have a 21in cutting width and are powered by a 190cc Briggs & Stratton Side-Valve Engine. It includes, as standard, a Mulcher, Rear Bag and Side Discharge that are usually options on other mowers. The whole Super Recycler range comes with a 5 year warranty as well making this one of the top picks for this type of lawn mower. Read what others are saying about the Toro 20055. Price: US$549 - The 20055 is not available in Australia but the 20056 and 20058 are. There is nothing more frustrating than trying to use your lawnmower with a broken or malformed wheel. And there is nothing easier than getting a replacement wheel, or set of wheels, for your mower. Most manufacturers claim that unless you use their branded parts and have your mower serviced by an authorised mower repairer, you will void your warranty. While this is true it doesn't apply for wheels. So, instead of buying them through a lawnmower dealer it's usually much cheaper, more convenient and quicker to purchase them from your local Kmart. What's more, Kmart usually stocks most of the common brands anyway or they have unbranded wheels that will fit generic sizes. It may, however, be harder to find specific sizes for most rider mowers but you should be fine with your push mower. If you can't find the specific wheel from Kmart your next best place to check is your local hardware store. They may carry different brands to Kmart as they usually have their own brand lawnmowers. Regardless, they may have something that fits and could possibly work better than the broken original. Finally, if you still can't find the wheel that your after it will usually be available at an authorised dealer outlet. If they don't have it in stock you may be able to order one and have it soon enough anyway. The JA62 sports a 189cc 6.57hp Briggs & Stratton while its big brother the JX75 has a 179cc 6.75hp Kawasaki engine. Neither models have electric start but they both feature gear-driven self-propulsion although the JX75 has 5 gears while the JA62 only has 2. The JA62 has the zone-start safety system (which cuts off the engine once the operator releases the handle). The main difference with the JX75 over the JA62 is that it has the new blade-brake system that stops the blades turning without the engine shutting off. This is a great advantage if you have a lot of lawn to mow and don't want to have to start the mower each you time you empty the bag. What are others saying about the JA62 and JX75? Epinions.com have some users who are claiming that the JX75 could be the "Best walk-behind mower made today". Sporting articulated steering and a Kohler 15hp engine the new Husqvarna consumer model, the R155, is set to be a winner. The All Wheel Drive (AWD) feature, which is still new technology for most cars, has now headed onto our lawns with the arrival of this new riding mower. Where it was once difficult to mow because of slippery lawn slopes or soggy grass patches, the 155 can now easily navigate through them. The AWD function is automatic and engages once it senses a loss of traction. The R155 comes with a 103cm (41in) cutting width with an optional 112cm (44in) width and 3 cutting blades and with its front mounted cutting deck makes this is a great option for the home gardener. The mower is so versatile with these two options (AWD function and the front cutting deck) that most lawns would easily accommodate it, even lawns that would not usually permit many riding mowers to access. The R155 is the base version mower, which most gardeners looking for this type of mower will purchase, but there are other versions available. The 15-V2 is a similar but more expensive version of the R155 with the major difference being the V-Twin engine. Two other versions the PR18 and PF21 are much larger mowers carrying 18hp and 21hp engines respectively and are more aimed at the commercial lawn mower. If your lawn has multiple obstacles, including low lying shrubs and garden beds, then the R155 would more suited to you than a mid-mounted ride-on. However, if your lawn is large with few obstacles then a cheaper tractor mower may be a better option. Husqvarna do offer a non-AWD version of the R155, the only difference being the lack of the AWD function. However, if your lawn doesn't have slopes or areas where traction is important it may be a cheaper alternative. Price: The R155 retails in Australia for A$6,995 and approx US$4,000 in the States. My friends at True Blue Turf keep telling me that this zoysia grass is all the new rage. Are they only telling me this because it's the main product they sell or are there reasons why they can be so confident in their lawn of choice? With so much pressure on water resources the race is on to find suitable alternative grasses to the ones we've always grown. Grasses like couches and kikuyu which demand great amounts of water to look good are falling to the wayside while drought-tolerant varieties such as soft-leaf buffalo's and zoysia's are becoming more popular. Most of the US zoysia grasses have originated from the Asian regions of Korea, the Philippines and Japan while the varieties now grown in Australia (such as Empire and Empress) have come from Brazil. As a lawn they're perfect because they grow well in any setting, even under shaded areas, and they are also slow growing. Therefore they require less maintenance than other warm-season grasses. The difference between the new buffalo's (Sir Walter and Palmeto are the popular varieties) and these new generation zoysia grasses is that buffalo grows by runners while zoysia grasses are grown from sods and are a rhizomous species of grass. Extremely drought tolerant. Zoysia's can live purely on annual rainfall in most temperate zones and if they don't receive enough water will turn brown but won't die. As soon as they start receiving water again zoysia grasses will green up almost immediately. Zoysia's grow well in almost any soil type and at varying levels of pH. They have a great tolerance for high salt levels lending themselves well to being grown in coastal areas. 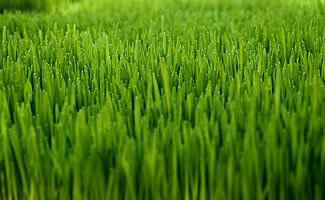 Due to their slow growing habit zoysia grasses require less nitrogen and mowing than most other grasses. Zoysia's due to their growing characteristics can easily thatch and create problems for your lawn. You may need to dethatch your zoysia lawn every couple of years and regularly aerate it. This isn't a difficult operation and may require only using your garden fork every spring. It's a slow growing grass and can take more than one season to cover the area as a full lawn. This is the reason why it may cost more to purchase as roll-on than kikuyu or couch lawns. If you plan to buy it just as plugs then consider buying more than the recommended amount per square metre so that it fills quicker. Zoysia grasses will also take longer to recover from problems due to their slow growth. This type of lawn may also create a few problems when it comes to mowing as the leaf blades are more rigid than other types of grasses. The grass blades are more prone to sit below the mower blades and resist being clipped. MTD's flagship Cub Cadet is offering two large ride-ons for the above average lawn. While most lawn mowing enthusiasts won't be in the market for these powerful mowers it's easy to appreciate (and possibly drool) over these two big boys. The 3100 which is powered by a 23hp Kohler engine is ample for the large lawn while the 3200 sports a 25hp Kohler is really only required when you just have to have the biggest. Both these mowers would be wasted for areas that are smaller than 6+acres but would be great for medium sized lawn contractors. They both feature RevTEK™ Reverse Mowing Technology which allows mowing in forward or reverse until the operator leaves the tractor seat, turns the key back to normal or turns off the engine. The attachments available give the consumer more options such as tillers, aerators, vacuum sweepers, snow blowers and the list goes on. Smart Jet™ Deck Wash System. High pressure water cleans out grass and debris build-up under the deck. 9-gauge welded-steel frame and a cast-iron front axle. Strength and durablity for a longer life. Half the price of an equivalent x700 John Deere mower. Haven't heard of any yet but will add to this as things come to light. I always thought lawn snobs were other people! You know the ones I'm talking about. If the lawn hasn't been mown in the past 2 days, it's getting a little too long; weeds never see the light of day and 40L bags of fertiliser are stacked in the shed in case of emergencies. They have edge trimmers, brushcutters, and a selection of mowers that can handle just about anything. And, they have signs on the verge warning you that this is a REGISTERED LAWN and should you fail to heed the warning and step onto their crisp blades of green - you will be prosecuted to the full extent of the law. In my teen years, I always desired to drive my hotted up XF Falcon across those lawns leaving an indelible stamp of unnaproval on these lawn snobs. Today, it's different. I'm actually facing the realisation that I'm one of those hated snobs. No. I don't have signs on the verge and I can wait a week before I feel compelled to bring the mower out. The problem is just that - I can't bring my mower out because the engine died just before Christmas and it's at the repair shop. I had to HIRE a mower!! Yuk! It would be the same as having to wear someone else's undies. There are things you just don't do. To make matters worse - it was a rotary mower. My poor blades of Sir Walter. It took massive chunks out of my grass taking great delight in ruining the lawn I've been tendering for the past 12 months. Did I mention I HATE rotary mowers? I have a new philosophy on life - if you don't have a reel mower, use pea gravel. A push mower is by far the most energy efficient and environment friendly mower that you could buy. In fact, Treehugger.com is recommending the big brother of the MM-1, the Luxus 38 as their lawn mower of choice. A push mower is a great way to mow your lawn with minimal service requirements and no power needs. And while there may be more effort on your part to actually mow the lawn there are limited differences between the push mower and a reel mower. Why the great debate? Certainly these two options can co-exist, right? Possibly. Some people are dogmatic about their choice of lawn mower and for very specific reasons, which they're usually happy to quote - ad nauseum. I think both mowers can have a place in our gardening shed (that is if you can afford the expense) or at the very least be used at different times for our lawn maintenance. They both have different roles to play and so long as you can appreciate their differences then gardeners can respect both pieces of equipment. Reel mowers (or 'real' mowers, as some like to suggest) mow your lawn in a vertical rotation. They lift the blades up and then cut their tips and are best at keeping a perfect law looking perfect. With the roller on the back of the reel mower it can keep your grass flattened and level which always looks great. However, reel mowers fail to level out the lawn. They will ride straight over bumps and can't cope with much debris in the way. Rotary mowers mow in a horizontal rotation. The blade, positioned under the engine, is designed to cut the blades at a particular level determined by the operator. This is great when you're trying to reduce sponginess in the lawn or when you're attempting to level it. However, while cutting at a set level is one of its strengths it can also be its downfall. For instance, if you're trying to mow around an edge of your garden and the border falls away into a garden bed you may find that the rotary mower can cut deeply into your grass. It doesn't allow for mistakes. The new Automower from Husqvarna is sure to be a winner in the garden this year and the reason: its new Luran S styrene plastic cover. It's a new plastic developed by BASF that won't fade or crack even under the most extreme weather conditions. It was developed in a joint venture between Husqvarna and BASF and is the Swedish manufacturer's first foray into the robotic lawn mowing field. If this is their starting point I'm sure they'll be in for the long haul but with a US$2000 starting price tag you may not see too many of these in gardens this year. The Automower is powered by battery and works on a boundary wire that's implanted on the edge of your property. The genius behind this model though is that it doesn't require supervision and setup by the owner. Once it's programmed the Automower lives outside permanently and will start by itself and return to its base for recharging once your lawn is mowed. This revolutionary mower will certainly be the item of choice for most armchair gardeners. It really is a set-and-forget tool. The next step in the progression for a truly automated robotic lawn mower will be Husqvarna's plans to produce a solar-powered mower. While the Automower must return to the base plate for recharging the solar-powered version will rely purely on the sun to recharge itself. Can this mower maintain an average lawn? Sure. It can mow up to 1800 square metres in one go and it works on the principle of a grazing animal: cutting little but often. However, unlike a grazing animal it has little or no emissions. The concept behind aerating your lawn is fairly simple. It rejuvenates your lawn by removing areas of thatch, making your soil less compact and allowing your lawn to less restrictive for water penetration. Over the life of your lawn you will notice that its continual growth will cause some of these problems to become apparent. Left alone and ignored your lawn will eventually die or struggle to grow and will show signs of stress. Before these signs become visible and the view of your lawn detracts from your garden you will need to provide some maintenance with te use of a lawn aerator. But which one should you use? Take a look at some of these examples. Lawn Aerator Sandals This is an easy option when your lawn isn't too compacted. It's not a good alternative if you're having serious problems with your lawn but if you want to keep up with some general maintenance these are a good idea. Strap the sandals to your feet as you perform many of your gardening tasks and these work as you do. They don't need to be applied during a particular season but they may cause some problems if you wear them when your lawn is wet or snow-covered. Fuel powered aerators are great for an annual aeration of your lawn. They're heavy duty machines which will remove thatch very well but shouldn't be used on a regular basis, i.e. more than once per year. It may be wiser to hire this type of aerator than to keep one yourself. The best time to use it on your lawn is toward the end of winter for areas that don't suffer frosts or snow and early spring for those regions that do. This is a similar machine to the Fuel-Powered Lawn Aerator with the difference being it is powered by electricty. The only limitation of this type of machine is the length of your extension cord. If you're working in areas with high traffic such as public gardens these really aren't an option for safety reasons. Also, if the lawn is quite large you will probably find the fuel-powered aerator a better choice. These are great for home gardens and you will find the price much cheaper than a fuel-powered machine. Hand-Powered Lawn Aerators are a step up from the sandals and not as easy to use as the electric aerator. The benefit is they can be used throughout the year, are cheap to purchase and have a limited maintenance regime. The beauty of a hand-powered aerator is that it is also easy to store in your shed and doesn't take up much room. They can be cleaned easily and the tines can be sharpened regularly. Tow Behind Lawn Aerator If you have a large expanse of lawn and currently use a lawn tractor (ride-on mower) then this is the aerator for you. Obviously it's at the top end of the price spectrum but when you have large lawns price is not the overriding factor - time usually is. This one attaches straight on to your lawn tractor and can be used quite easily and effectively.